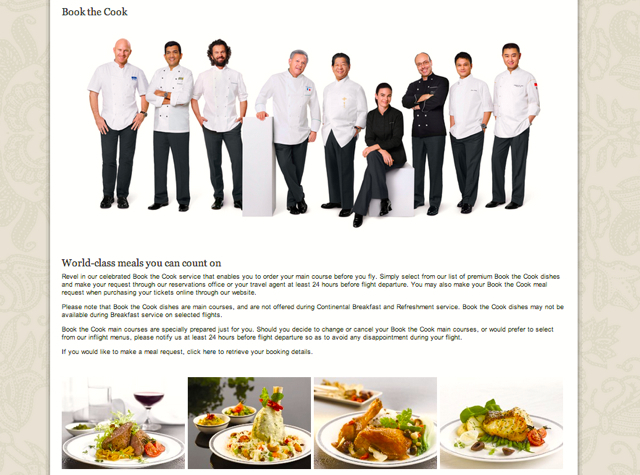 Singapore Airlines' Book the Cook allows Suites, First Class and Business Class guests to pre-order a meal from a variety of Asian and Western menu options, for flights departing from select cities. Having taken 3 Singapore Suites flights recently, and helped Award Booking clients choose meals, I thought I'd share some recommendations for the service. Are the Same Book the Cook Menu Items Offered from Each City? No–the Book the Cook menu selections differ by location. For example, Book the Cook from Dubai offers Prawn Machbous, a spiced rice dish popular in the Gulf and considered the national dish of Bahrain; Milan's Book the Cook Western menu features several Italian dishes, such as Grilled Lamb Chops with Spinach Polenta Crespelle and Truffled Tortellini with Parma Ham; and of course Singapore's Book the Cook features extensive Singaporean choices such as Prawn and Chicken Laksa, Nonya Assam Fish and Singapore Bak Kut Teh, in addition to Malay, Thai, Indian and Western selections. While I haven't tried this as a Book the Cook option, I enjoyed a surprisingly delicious lamb rendang as part of Nasi Padang on the regular menu from Frankfurt, so I can only imagine how good the Singapore version must be. Clients of mine that enjoy Indonesian and Malaysian food often order this. 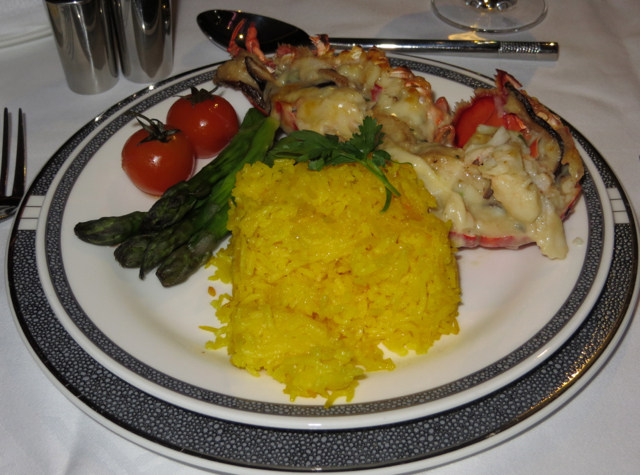 How many restaurants, let alone airlines, even serve Lobster Thermidor these days? This is a lobster as dressy comfort food, and my only complaint was that there wasn't more of it. This isn't Japanese food for those who like California rolls at their local sushi joint–kaiseki is Japanese haute cuisine, highly seasonally driven and served in multiple courses. Pro tip: you may not see this option on the short Singapore Hong Kong flight in the Book the Cook dropdown, but you can phone in to request it. For beef lovers, Wagyu is the creme de la creme, and a good bet if flying Singapore Suites or First Class from Singapore if you're not tempted by the many stellar Asian selections. I haven't actually ordered this personally via Book the Cook, since I make a pretty mean laksa myself, but again, clients who've had this seem to enjoy it. 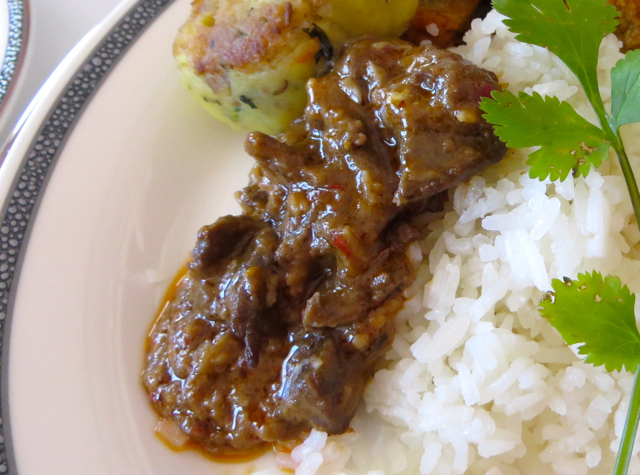 As with the Rendang, another favorite Malaysian/Indonesian choice, especially if you prefer chicken to beef. Vegetarian Jain Meal: No meat, seafood, egg and dairy products are used in the preparation of this meal. Onions, garlic, ginger, mushrooms and root vegetables are also not used. Vegetarian Ovo-Lacto Meal: Prepared in Western style, this is a non-strict vegetarian meal which can include eggs and dairy products but eliminates all meats and seafood. No Carbohydrate Meal: No starch and carbohydrates in any form will be featured in this meal. Gluten Free Meal: No wheat, rye, barley, oats and bran in any form (including food items which may contain such ingredients) are served for this meal. Low Lactose Meal: This meal excludes foods which contain milk, dry milk solids, casein, cheese, cream, butter, lactose and margarine. Diabetic Meal: Sugar is not used in the preparation of this meal. Salt in restricted quantity is allowed. Ulcer Diet Meal: This meal contains easily digestible, plain, poached and broiled foods (e.g. white meat or fish). Food or fruits that are acidic (e.g. citrus fruits) are avoided. Non-Strict Nut Free Meal: Ingredients such as groundnuts and legumes are omitted from this meal. Singapore Airlines may not offer some of the other nice ground perks such as chauffeur service or 15 minute complimentary massage treatments, but they've pretty much nailed being able to customize and pre-order your meal selection. Is it as good as my favorite high end restaurants? No, but then again nothing I've tried in a number of first class airline products is. 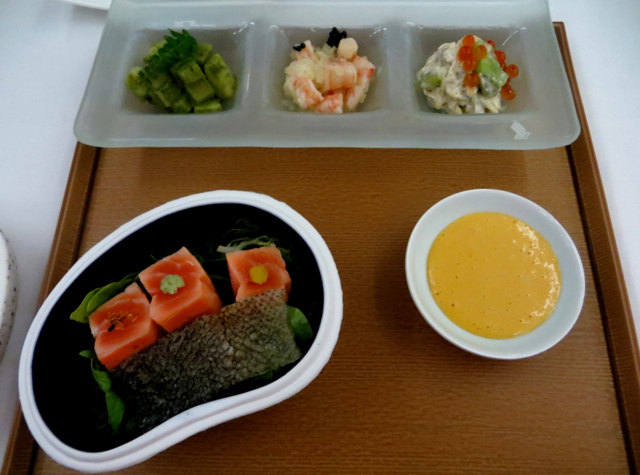 I can say that even though the occasional Book the Cook option hasn't been so great, Singapore Airlines' great cabin service ensures I always end up eating something delicious, especially from the Asian menu. What are your favorite Singapore Book the Cook meals?